The quickest way to add color to a shape is with Quick Styles. 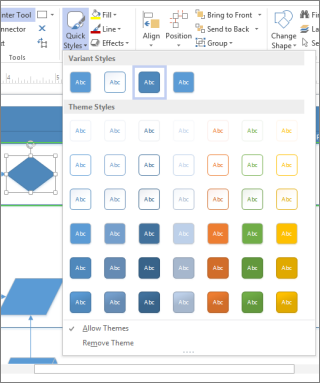 Click the shape you want to change, click Home > Quick Styles, and then pick one of the colors, any of which match your drawing’s color theme. Note: The Quick Styles button might not appear if it's expanded. On the Home tab, in the Shape Styles group, click More to choose a color. It’s easiest to add gradients or patterns using the Format Shape pane. Right-click the shape you want to change, then click Format Shape. The Format Shape pane normally opens by default with Fill & Line open (as in this picture). Click Fill. Click the type of fill you want. Use the options for each type to make it look like you want it to. Solid fill Choose the color and set the transparency – lower numbers mean less transparent and higher numbers mean more transparent. Gradient fill Set the orientation and style of gradient, the colors, and how the colors change from one to the other. Pattern fill Pick the type of pattern, the colors it will use, and the pattern’s transparency. Tip: Change more than one shape at a time by holding down Ctrl while you click the shapes you want. 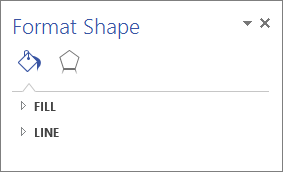 If you have shapes in a group, they can be changed at the same time by clicking the group. By the way, this works for more than just shapes. These same steps work on containers, callouts, and text boxes. Note: To remove all fill from a shape, in the Format Shape pane, under Fill & Line, click Fill > No fill.